Thanks for signing up! Be sure to take photos of your transformation and use the #3DAYJUMPSTART hashtag so I can follow you! “This is a great thing to keep on hand. I love my energy on this. 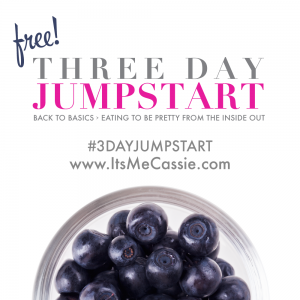 When I find myself starting to slip into old habits, I do the 3-day jumpstart and it gets me right back on track! Secondly – I took the challenge to do 50 miles in May. I traveled about 13 days out of the month, so it got a bit challenging. Ended up at 55! What I didn’t know is that it prepared me to do one of the hardest hikes I have ever done! I dropped my youngest off at YSSC to work for the summer and since it is at the southern tip of Yosemite, I decided to go into the park for a hike. I did the Upper Falls hike, 7.2 miles round trip, 2,700’ elevation gain. I really believe that in large part for doing the 55 miles in May, my legs and heart handled the hike like champs. 5.5 hours round trip with about 45 minutes on top enjoying the view! The guides said to give oneself 7 hours for the round trip hike. Feeling very good about myself!” Rachel S.